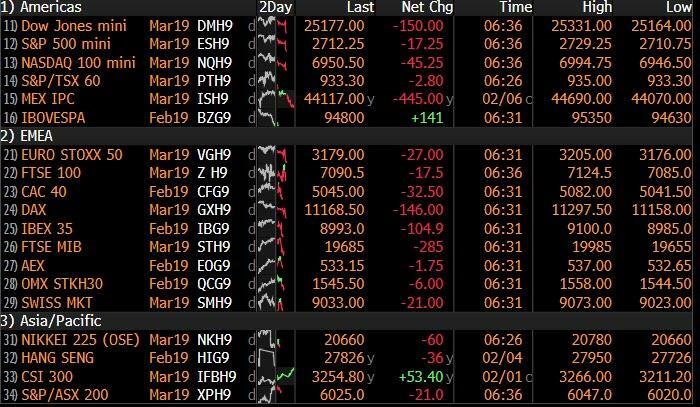 US traders walked in to a sight that brought in painful memories from December: a sea of red in global markets as stocks in Europe fell alongside S&P futures following a mixed session in Asia where India's central bank joined the global easing bandwagon with a surprise rate cut. Italian bond prices tumbled after the European Commission confirmed yesterday's media reports when it slashed growth forecasts for the euro region’s major economies, while dollar scored its longest winning streak since a hot run in early October that helped set off a wave of global bear markets. Poor earnings and weak data out of Germany ensured Europe’s main bourses started lower and kept MSCI’s index of world stocks heading for only its second two-day run of falls of the year so far. Europe's Stoxx 600 Index tumbled, dragged down by automakers and banks as sharply lower trading revenue from Societe Generale countered positive results from UniCredit and DNB. The euro weakened and bunds rose after the European Commission warned in their dour growth forecast that Brexit and the slowdown in China threaten to make the region’s outlook even worse, slashing Euro area growth to 1.3%, while Italy's 2019 GDP forecast was cut from 1.2% to just 0.2%, barely above recession territory, and putting the country's controversial deficit forecast in joepardy. As a reminder, Italy agreed a deficit target of 2.04 percent in December, averting a major fall-out with the EU, though this was based on a growth assumption of 1.0 percent. Slowing growth in Italy could make it harder for the country to remain within EU rules. As a result of the downgrade, Italian 10Y yields popped higher, rising near 2019 highs, which is notable because when the report first hit yesterday, markets were largely oblivious and instead were congratulating themselves on the 5x oversubscribed Italian 30Y bond that priced yesterday tighter than expected. Today is the hangover. European banks reversed initial gains after the EC cut its growth forecasts for the region’s major economies. The Stoxx 600 Banks Index is down 0.9% as of 11:48am CET, having earlier risen as much as 0.5%. Biggest fallers are Raiffeisen and Commerzbank, both -3.3%. Italian banks trimmed earlier gains of as much as 2.7%, with the FTSE Italia All-Share Banks Index still up 0.2%. UniCredit raises 2% after 4Q earnings that exceeded plans for cost cutting and improving asset quality. London’s FTSE was the only major bourse clinging to positive territory. Adding insult to European injury, the euro slumped to $1.1330 following the latest dismal report out of Berlin as Germany reported its fourth consecutive drop in industrial output, which declined -0.4% in December, far below the 0.7% increase expected, and down -3.9% YoY: "Another day, another piece of terrible German data. EUR/USD risks a move to $1.1300," said ING’s chief EMEA FX and interest rate strategist, Petr Krpata. Earlier, MSCI’s broadest index of Asia-Pacific shares outside Japan added 0.1% as it rose to its highest since early October, rising steadily since early January as the Fed capitulated to markets and changed its tune and emerging markets have surged more broadly after a torrid 2018. Australia’s benchmark stock index jumped 1.2 percent amid expectations of easy monetary policy after the country’s central bank chief shifted away from his previous tightening bias. Japan’s Nikkei slipped 0.6 percent though and the caution quickly spread to Europe. Treasuries climbed with the dollar, which advanced for a sixth day as Federal Reserve Chairman Jerome Powell gave a brief but positive assessment of the economy and several of the world’s central banks put their tightening plans on hold. Elsewhere the pound was struggling near $1.29 again ahead of a Bank of England meeting, while gloomy jobs data saw New Zealand’s dollar suffer a similar flop as its Australian counterpart had seen the previous day. The kiwi slid to $0.6744, losing nearly 2 percent in the past 24 hours, as investors wagered on the risk of a cut in interest rates there. The country’s central bank holds its first meeting of the year next week. The broad dollar gains put pressure on gold, which eased to $1,303.96 per ounce, slipping further from last week’s top of $1,326.30. Oil prices eased too after U.S. crude inventories rose and as production levels in the country held at record levels. Brent crude futures slipped 23 cents to $62.46. U.S. crude eased 19 cents to $53.82 a barrel. Expected data include jobless claims. Fiat Chrysler, Kellogg, Philip Morris, T-Mobile, and Twitter are among companies reporting earnings. In FX, the Kiwi has dropped to the bottom of the G10 pile on the back of a relatively bleak NZ jobs report overnight, as employment growth almost dried up in Q4 and the unemployment rate rose more than expected. Nzd/Usd is now hovering around 0.6750 and in danger of testing support just ahead of 0.6700 having lost grip of the 0.6900 and 0.6800 handles in very short order, while the Aud/Nzd cross has snapped back above 1.0500 from close to 1.0400 only yesterday even though the Aussie continues to weaken independently on the RBA shift from a tightening to neutral bias, with Aud/Usd pivoting 0.7100 and edging closer to bids/tech support circa 0.7075. In commodities, Brent (-0.5%) and WTI (-0.4%) prices have been choppy but are ultimately in the red, although off of session lows as the impact from yesterday’s EIA data showing production remained unchanged at the record level of 11.9mln BPD dissipated overnight where trade in the complex was largely flat. In recent news flow Libya’s NOC is said to have not ordered the Sharara oil field to be reopened; Libya are reportedly producing 950k BPD of oil. Separately, the TransCanada Keystone oil pipeline was shut due to a potential leak in the Missouri area; however, it was unknown if the leak originated from Keystone. Finally, sources noted that Saudi oil output fell to 10.24mln BPD, below the target level under the OPEC production pact. Gold (Unch) prices are muted and trading within a thin USD 5/oz range, the yellow metal is still above the USD 1300/oz level and continues to move in tandem with the buck. Similarly, London Metal Exchange copper has retreated from the two months high reached in the previous session as the dollar firms and China’s absence due to their holiday continues to impact markets. We’re in full blown DB research promotion mode at the top here this morning as we have just published a major global growth downside risk analysis, have downgraded our European growth forecasts and have published our latest House View document. We also have a few spaces left at a high profile Brexit panel this afternoon in London to offer up to readers. Overnight our global economic team published a comprehensive note reviewing the major downside growth risks: trade policy, Brexit, and China. They look at the “tail risk” scenarios for each, reasonably finding that the different shocks would have disparate effects on various regions, though a perfect storm of worst-case outcomes on each front would prompt a very severe downturn. They also downgrade their baseline forecast for euro area growth to +0.9% this year. The full note is available here . Separately, my House View team published the latest edition of their flagship publication, titled: At the crossroads. They review the global macro outlook, the key themes and risks, and our strategists’ cross-asset forecasts. Overall, there are not major changes to the outlook from the December edition, but many of the major issues impacting growth and markets are set to escalate or be resolved in the next several weeks. The report is available here . For those that want to know exactly what is going to happen with Brexit, DB is hosting an event later with three high calibre external speakers on UK politics and Brexit. James Forsyth, Political Editor of the Spectator, will help us solve the rubics cube of Conservative Party factions and upcoming Westminster votes. Stephen Bush, Political Editor of the New Statesmen, one of the most plugged in commentators on the Labour Party, will help navigate Jeremy Corbyn’s vision for Brexit and government. Allie Renison, Head of Europe and Trade Policy at the IOD, will help us understand how industry is preparing for no deal, and the EU’s side of talks. DB’s Brexit expert Oli Harvey will moderate. The event starts at 4.45pm in the Deutsche Bank Auditorium, with drinks afterwards with DB Macro Trading. Please register your interest in attending here . More on Brexit later but in listening to the adverts above you haven’t missed much as this continues to be a quiet week as was expected given the lull in important events. US bourses ended slightly lower last night, with the closing moves for the S&P 500, DOW and NASDAQ being -0.22%, -0.08% and -0.36% respectively. The S&P 500 snapped its run of five straight daily advances, while the dollar notched its fifth straight advance, gaining +0.32%. That was after the STOXX 600 eked our gains of +0.15% in Europe to take its run of successive gains to seven and the most since September-October 2017. Cash HY spreads in Europe and the US were -6bps and -2bps tighter respectively while Treasuries and Bunds ended the day close to flat. So really not much to write home about. To be fair I suspect my wife would be very confused if I wrote home to tell her anything about anything. In fact it seems crazy to think that when I was a student I used to write long flowing letters to old friends, girlfriends and family and then find a letter box to post them. It would be interesting to know the age of the youngest reader who has actually sent regular love letters in the post rather than an email or a WhatsApp. Even phone calls when I was a student were a sign of needless extravagance. Anyway I digress, in terms of what news we did get yesterday, US Treasury Secretary Mnuchin unsurprisingly reiterated the intention to reach a trade deal with China. He said that “we’re putting in an enormous amount of effort to try to hit this deadline and get a deal.” Elsewhere the US trade deficit data for November was released yesterday, showing a slightly better-than-expected balance at -$49.3 billion. That could mechanically raise fourth quarter growth expectations, but our economists expect it to be balanced out by large imports in December, probably in an effort to front-run tariffs that took effect on January 1. Meanwhile Germany’s soft factory orders data in the morning initially sparked a bit of risk-off with earnings not helping as the day progressed. Indeed weaker than expected reports from Electronic Arts (-13.31%) and Take Two (-13.76%) seemed to more than overshadow positive snippets from General Motors (+1.58%) and Snap (+21.59%). Microchip Technology (+7.29%) also had a good day after the CEO predicted that we may have seen the bottom in the cycle for the industry. Those remarks helped the broader semiconductor index gain +2.59%, taking it back to near its level of early October. Over in Europe our equity strategists highlighted overnight that with 30% of companies having reported, Q4 European EPS growth stands at 1% year-on-year, down from the Q3 growth rate of 8%. This is in line with consensus expectations for the companies that have reported. However, EPS growth expectations for the full Q4 earnings season have been marked down from 3% at the start of the season to almost 0% now. Energy, consumer staples and consumer discretionary sectors have seen the biggest upside surprises to earnings, while communication services and technology have seen major disappointments. Click here for the link. Late last night we heard from Fed Chair Powell and the Fed’s vice chairman for banking supervision Quarles. Powell gave a brief but positive assessment of the economy by saying that “The U.S. economy is now in a good place; at the moment, unemployment is low, prices are near two percent inflation, so we’re in a good place now.” Quarles also gave a similar assessment of the economy by saying that “the outlook is still very solid and the labour market is an extremely solid labour market, and inflation pressures remain muted.” However, Quarles added that global risks represent the most significant risk to the outlook and like the Fed’s Kaplan who provided calendar-based guidance earlier in the week, Quarles went on to say that he will be looking to analyze these risks more over the next 6 months. So, another member to provide a bit more explicit guidance in terms of calendar-based guidance. In Asia this morning markets are trading mixed with the Nikkei (-0.62%) leading the decline with almost every sector trading lower amidst a slew of earnings releases even as Softbank shares are up as much as +17.54% on the announcement that the company will buy back as much as JPY 600bn ($ 5.5bn) of stock. Meanwhile, the Kospi (-0.03%) is trading flattish post markets re-opening after three days of holiday and the Australia’s ASX (+1.10%) is continuing its move up after yesterday’s surprise shift in policy stance by the RBA. Markets in Hong Kong and China are closed for holidays. Elsewhere, futures on the S&P 500 are down -0.23%. In other news, the US President Trump has nominated senior Treasury official David Malpass to lead the World Bank. In the past, Malpass has been sharply critical of China and has called for a shakeup of the global economic order. As for Brexit, as we today enter T-50 until March 29th, it was a case of sifting through all the noise again yesterday. The most headline-grabbing comments on Bloomberg was perhaps those from Tusk who didn’t mince his words by saying that there is “a special place in hell for those people who promoted Brexit without any plan for how to deliver it". This won’t encourage the hard Brexiteers to compromise and will therefore not be seen as helpful. He also confirmed that the EU will make no new offer to PM May and “will not gamble with peace in Ireland or put a sell-by date on reconciliation”. The EC’s Juncker and May are due to meet this morning at 10am GMT however there is little sign of any concessions from either the EU or Ireland to May. What is interesting though is contrasting the Tusk comments to those from Germany. Yesterday Reuters reported that a German government spokesman had said that Germany is “prepared to show creativity on Brexit”. That backs up earlier softer comments from Merkel, albeit comments that seemed to be stretched somewhat in the press. The euro finished -0.39% yesterday. Staying in Europe, BTPs underperformed (10y +6.6bps) yesterday after the new 30-year deal was confirmed as an €8bn deal which seemed to eclipse expectations for closer to €6-7bn. That said the order book did pass an eye-watering €41bn and therefore eclipsed last month’s demand for shorter bonds. Separately, Italian news agency Ansa reported that the European Commission may downgrade Italy’s 2019 growth forecast to as low as 0.2% in new updates due later today. Our economists are at 0.7%, in line with the consensus private sector forecast. Meanwhile, the IMF in its review of Italian economy said that the annual GDP growth is likely to stay below 1% through 2023 while also adding that the Italian government is falling short on needed reforms for sustainable growth. Finally, Bloomberg reported that the ECB sees no urgency for implementing new TLTROs, which would also be bearish for Italy if true. In other markets yesterday WTI oil closed +0.50% higher after US data showed smaller-than-expected builds in crude and gasoline inventories. Iron ore rose +0.76% yesterday, as it continues to steal the limelight in commodities post the tragic Brazil dam disaster. The video clips are truly horrifying if you haven’t seen them. Iron ore is up +25.53% this year already and +36.26% from the early-December lows. Moving on. The main event today should be the BoE meeting. While no change in policy is expected our economists expect the outcome to be a lot more dovish with a material risk (50% chance) that the MPC drop their tightening bias altogether and move to neutral. The rational is: a) significantly weaker domestic survey data pointing to below potential growth b) weaker external conditions c) sizeable downside miss to the BoE’s inflation forecasts. As a minimum the team expect Carney to endorse current market pricing which right now is around 15bps worth of hikes this year. More in their report here . As for the data that was out yesterday, as highlighted at the top, Germany’s December factory orders data made for fairly bleak reading with orders down -1.6% mom during the month (vs. +0.3% expected). The annual rate weakened to -7.0% yoy as a result which is the weakest since 2012. Finally to the day ahead, where this morning we’ve got more important data out of Germany with the December industrial production report (+0.8% mom expected). Shortly after we get the December trade balance in France and then January house prices data in the UK. This all comes before the BoE meeting at midday while in the US this afternoon we’ll get the latest weekly initial jobless claims reading – which is worth a watch in light of the big spike to 253k last week (shutdown related or not?) – and then December consumer credit data later this evening. Away from that, the Fed’s Kaplan (2.15pm GMT) and Clarida (2.30pm GMT) are scheduled to speak today while the ECB’s Mersch speaks shortly after midday. The European Commission’s latest forecasts are also out while the earnings highlights are Total, L’Oreal, Sanofi, Twitter and T-Mobile.